Asus ROG Zephyrus S (GX531GS) announced as world's slimmest gaming laptop. 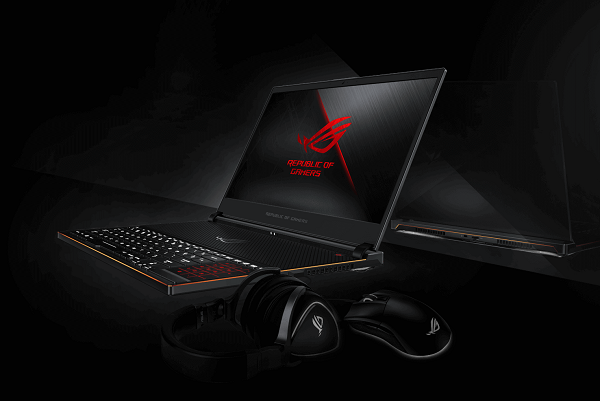 Asus today announces ROG Zephyrus S, the world's slimmest gaming laptop. At a mere 14.95~15.75mm, the new ROG Zephyrus S is 12% thinner than the original. It features super-narrow bezels, 8th Generation Intel Core i7 six-core CPU and up to NVIDIA GeForce GTX 1070 with Max-Q Design GPU. The ROG Zephyrus S's super-narrow bezels squeeze the 15.6" display into a 14.2" chassis. The Zephyrus S offers refresh rate of 144Hz and response time of 3ms for an even clearer picture in the heat of battle. It comes with Intel's latest Core i7-8750H Coffee Lake processor that offers six cores and 12 threads of parallel processing power. The extra cores also provide headroom for multitasking if you want to mix gaming with live-streaming, recording, and other tasks. GeForce 10-series graphics up to the GTX 1070 with Max-Q Design boost performance in apps that support GPU acceleration. More importantly, the discrete graphics chip is capable of pumping out triple-digit frame rates in popular games, which is the best way to get the most out of the display. The Zephyrus S's CPU is backed by fast DDR4-2666 24GB memory and NVMe storage, while 802.11ac Wave 2 WiFi connects to compatible wireless networks at greater than gigabit speeds. Type-C USB 3.1 Gen 2 and full-size HDMI 2.0 support desktop monitors and big-screen TVs, allowing you to connect dual auxiliary displays. More USB ports are ready for essential gaming peripherals and ubiquitous external storage, and there's a Type-A USB 3.1 Gen 2 with additional bandwidth for compatible devices.